have passed the gates many times since I was at Ullswater in 1967, and I always wanted to enter but never did. Now thanks to the hospitality of Annette Cameron and Phil Williamson from The Trust, I have returned to The Outward Bound Mountain School at Ullswater for the first time in 47 years. 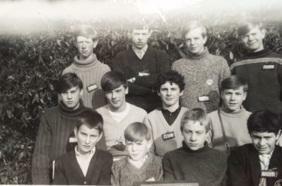 I attended the Outward Bound Course from 30th January 1967 to 25th February 1967 at the age of 14. The course number was U 116 ( J ). The Warden was Squadron Leader Davies and Mr Reynolds was my patrol leader. I was in Mallory patrol. I was very nervous as it was my first time away from home. The course was made up of boys from all over the country. It was very tough but as the course progressed I began to enjoy it. I felt very honoured to be there as each year only 4 boys were selected to attend from Leicester schools. Some of the work and expeditions were very demanding. I got lost once on an orienteering run and a rescue party came out for me. I was reprimanded as I had continued alone when my colleagues turned back, thus breaking one of the first rules of the fells. I was the leader of our final expedition a 3 day trek culminating in a climb of Great/Green Gable. Memory tells me that we did it in a whiteout. I learned a lot about myself on the course and a lot about leadership which has been invaluable in my life and career. Of course you don't realise this at the time when it just feels like a very big adventure. I had hoped to get a blue medal at the end but I did not. I guess I made too many mistakes but these are all part of the learning process. I would not have missed it for the world. It helped make me what I am today and it began my love of The Lakes and the fells which has never waned. Prior to my visit I searched for my Outward Bound memorabilia and found the course photo, the patrol photo, my log book and a cloth badge. I am still looking for my red junior badge. I have also found my certificate and a letter from my school head describing to my Dad some of my report. As I drove down the drive with my wife, Vishva, many memories came flooding back. Annette and Phil were there to welcome us and a group of new arrivals were gathering on the forecourt. I felt like telling them to make the most of their opportunity as they would remember it for the rest of their lives. We were given a guided tour of the grounds, the lake shore and the buildings. Much has changed but some things remained the same, echoing over the years glimpses of my early life. Over tea we talked about the importance of the Trust and its work in the 21st Century. At the end of my visit I was given for the first time a copy of my full report and a copy of the Wardens report. Before my visit I had hoped that I had remembered my time there correctly. I was afraid that the past is another country which is sometimes different to how we remember it. As I drove away I stopped at the gates to read the reports. They were chillingly accurate and a great pointer to things that would benefit me in my later life. The Wardens report described many things that I was not aware of at the time. I smiled as I read ;” a particularly fine effort was put in by Mallory Patrol, who reached the summit of Great Gable, in high winds and extreme winter conditions.” So I had remembered it correctly, I had led the patrol up Great Gable in a whiteout. I still regard it as one of the greatest achievements in my life. Thank you to those in 1967 who made it possible and thank you to Annette and Phil for making it possible today.